A teenage pregnancy changes the life chances for both mother and child over the short and long term and not surprisingly there are big efforts made by health professionals worldwide to cut back on their numbers. The key is seen to be awareness, but the weakness of so much health education is that it starts from the worldview of the professional – which is rational and factual. It doesn’t start from the mindset and values of those who are being targeted. The Lancet recently reported on just one such example, which in fact had the opposite effect of what was intended. The idea behind the programme in Western Australia was simple. Give teenage girls in school ‘simulator dolls’ to take care of that cry and wet themselves. That should teach them how hard life is looking after a little one. It is not a new idea. Around ninety countries worldwide have the same programme. But remarkably, few of those seem to have been tested to check whether in fact it works. The study in Australia showed that there, in fact it did the opposite. Teenage girls that were targeted came out more likely to get pregnant, than less (36% more, compared to schools without the programme). The intervention achieved what was intended in terms of understanding, which is to show that life might be hard with a little one, but it also triggered their values of caring, self worth and attachment by asking them to imagine caring for a baby. Their values won out. There has been a movement in recent years of health education to learn lessons like this, through using the toolkit of social marketing. I was privileged to work with Dr Jeff French to set up the first UK social marketing effort with the NHS in England over ten years ago. The European Social Marketing Conference runs over the next few days, with a World Social Marketing Conference due in the USA in 2017. It is not that a direct prompt on values is always right, when it comes to behaviour change, but if you don’t start from the values of those you are focusing on, then it is your values that fill the gap. And then, it is only you that is persuaded. 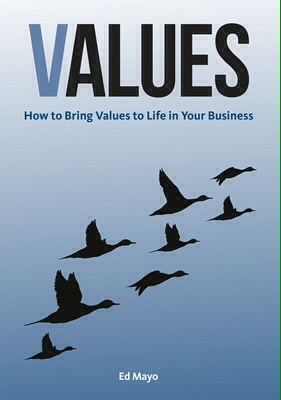 Values: how to bring values to life in your business is published in October 2016 by Greenleaf. The idea that business is about money pure and simple has endured because it is an idea that is simple. That there might be other motivations, and ones more effective at helping people to work together, feels complex. So when it comes to values, the challenge is to get simple and practical. How do you chart the values at work in a business? How do you bring values to life? How do you recruit for values? This is the focus of my new book, which is a short book (90 minute read) called Values: how to bring values to life in business. It covers a range of practical tools to make values count. It will be published by Greenleaf – pre-orders up now on https://www.greenleaf-publishing.com/values – next month, around the time of the first World Values Day. A new financial instrument for co-operatives? Following our collective efforts the UK Government has confirmed co-operative and community benefit society debt securities will be eligible for the new Innovative Finance ISA. In the past few days our lobbying has prompted government officials to pause in their final drafting of the Innovative Finance ISA regulations to pay particular attention to society eligibility and set things straight. We are very pleased to have clear assurances that for the purposes of the new ISA the term ‘company’ can now be interpreted as including societies. In summer 2015 HM Treasury consulted explicitly on whether or not to make society debt and equity eligible for the Innovative Finance ISA. We have consistently argued strongly in favour of debt securities being eligible. HM Treasury had never ruled this in or out, but it did omit any reference to society eligibility in its November 2015 consultation response and then referred only to including ‘companies and charities’ in its notes on the draft legislation. While we don’t have a formal indication of a change in policy, we have been given an assurance that subtle changes to cash ISA rules in 2015 allow for an interpretation of ‘company’ that can be taken to include societies going forward – which is welcome news. [Please note though, this is not legal advice, simply an indication of how the law could be read]. The input to the consultation of so many co-operatives, has made a practical difference. The ISA legislation will come into force as part of the Autumn Statement in November. It will then be for regulated financial institutions such as banks, building societies and larger credit unions, to explore whether or not developing a co-operative or wider social investment ISA is feasible. There are opportunities here, but they won’t happen overnight. I am speaking at the International Summit of Co-operatives in October on our sector hopes and activities around co-op and mutual capital. For now, a future opportunity is here. 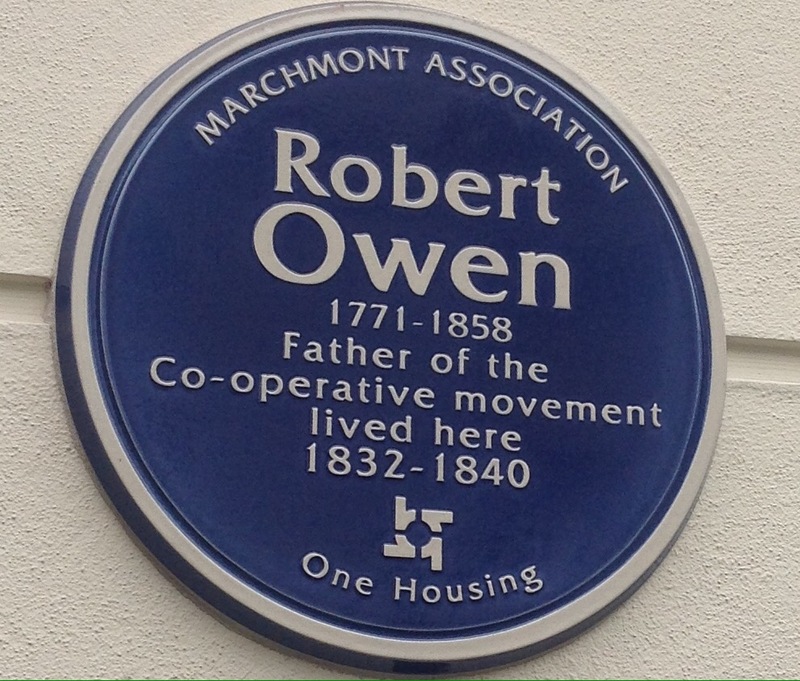 It is a pleasure today to talk at a Blue Plaque going up near Kings Cross in London to Robert Owen, the great social reformer and co-operative advocate of the early 19th century. The man is historical, but his ideas remain contemporary, and ones that we can still learn from. In the early nineteenth century, he cut the hours of his cotton mill workers from 17 hours a day to 10, and banned the employment of children. Over four years, the business made a profit of £160,000 and a return on capital of 5%. Robert Owen was fascinated by the potential of a more co-operative culture. In 1812, he wrote the first of his “Essays On The Formation Of Character”. As he described it, character is a set of habits, behaviours and beliefs that are shaped by the environment in which we find ourselves and in which we have grown up. Owen set out to make character visible. Black, blue, yellow and white were the daily colours assigned by Owen to workers in his pioneering mills at New Lanark. Black was bad behaviour, blue indifferent, yellow good and white was excellent – a shared and open form of feedback. For children, Owen invented the world’s first workplace nursery, or crèche – the New Institution for the Formation of Character – which opened on January 1st, 1816, financed out of company profits. As soon as children could walk, they came to the creche and, at the age of three, they entered the infant school. The teachers were specifically instructed to be kind and encouraging in order to instil self-confidence. If you encourage a co-operative culture, then you build the opportunity for participation and well-being. In an age of inequality, we can still learn from the ideas of Robert Owen.